It has been a busy year for British perfume brand, Jo Malone. So far in 2014 they have launched four deluge-inspired colognes as part of their London Rain Collection, a new addition to their Cologne Intense series ‘Tuberose Angelica‘ and they’re set to launch the very intriguing ‘Wood Sage & Sea Salt Cologne’ in September. So yes, the perfumers over at one of Britain’s most popular fragrance brands have been working very hard indeed. In amongst these new launches is a limited edition fragrance, and the subject of today’s review, entitled ‘Silk Blossom Cologne‘. Created by perfumer Marie Salamagne (Vivienne Westwood’s Let it Rock and Guerlain’s Aqua Allegoria Mandarine Basilic) and inspired by the “pink-fringed pompoms” of the flower, from which it takes its name, Silk Blossom is an airy, roseate fragrance that celebrates pale, powdery and blush tones of pink. “Nature’s blooms at their most tempting. The pink-fringed pompoms of Silk Blossom. Irresistible to hummingbirds and butterflies. Apricot-fresh with a touch of spice. nestling on a bed of moss. Even if one was not privy to the pleasing plethora of pink that adorns the Silk Blossom bottle (the ombre pink tassel is particularly adorable), the top notes most certainly give the game away, spritzing out an incredibly pale blast of pink, peachy sweetness. The impression is of a delicate peach water, diluted with the soft effervescence and spice of white pepper. There’s a nice balance between these two opposing forces in the opening however, it doesn’t make for an entirely bold or distinct character from the outset. The base promises moss and delivers to a certain extent. That said, perfume lovers expecting a big hit of some Mitsouko-level damp greenery, may need to adjust their expectations. What Silk Blossom does have, is a slight sharpness and a touch of something sour underpinning the florals, fruit and spice. The effect is much more akin to the ‘cleaned-up’ patchoulis used in many a modern pseudo-chypre, and whilst it is enjoyable, one can’t help but wish for a touch of dirty soil to provide a decent level of contrast. Silk Blossom is both pretty and pleasant, but it ultimately comes across as a little bit too thin and pale. It plays with similar ideas to those explored in Maison Francis Kurkdjian’s masterful Amyris Femme, namely; plush, powdery pink flowers and solar citrus, but where Amyris feels luxurious and cut from expensive cloth, the Jo Malone comes across as wan, relying too heavily on the transparency of musks. 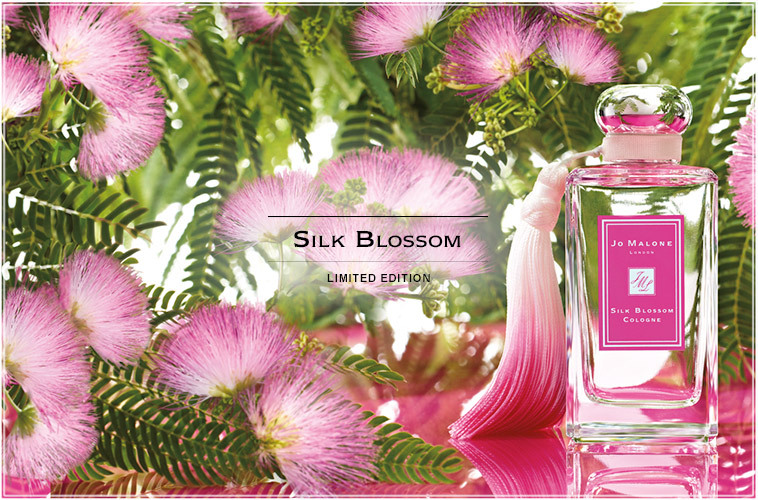 Still, if you’re a fan of the brand and like a lighter take on all things pink, then Silk Blossom may just be worthy of a sniff or two. Jo Malone’s Silk Blossom is available in 30ml (£41) and 100ml (£82) Cologne. A matching candle is also available for £42, the full sale price of which will be donated to the Company’s charity gardens. You can read more about the charity candle here. Sample, notes and quotes via Jo Malone. Image 1 via identity.uk.com. Image 2 via sandrascloset.com. Posted in Feminine, Floral, Fruity, Jo Malone, Perfume Reviews and tagged Amyris Femme, Feminine, Floral, Fruity, Jo Malone, Maison Francis Kurkdjian, Marie Salamagne, Perfume Review, Silk Blossom. Bookmark the permalink.